Man runs out of gravy at home, so he steals it from the Walmart store in Vero Beach. 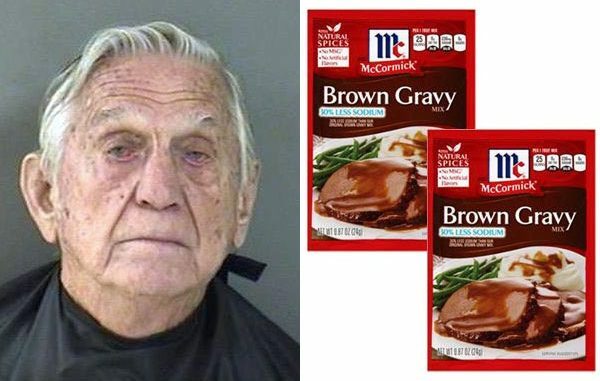 VERO BEACH – An 84-year-old man was arrested at the Walmart in Vero Beach after stealing several packets of gravy and a box of wine. Daniel Mostowy told the Indian River County Sheriff’s Deputies that he was cooking at home and ran out of gravy. Mostowy said he went to the Vero Beach Walmart to grab some gravy with the wine and just wanted to leave quickly, so he left without paying for it. But Mostowy didn’t know that Walmart’s loss prevention spotted him as he entered the store because he’s a repeated shoplifter and has already been trespassed. A security officer watched as Mostowy grabbed a box of wine from a store shelf and place it into a white Walmart bag, which he removed from his pocket. Mostowy was then seen walking towards the front of the store passing through closed registers before making his way to through the exit. The loss prevention officer asked Mostowy to go with him to the office, and he agreed. At first, they only saw that he stole the box of wine. However, Mostowy started “removing several bags of gravy mixes attempting to conceal them behind the computer monitor” in the office, according to the report. The officer asked if he had any more merchandise, and he said yes, “and removed several packets of gravy mix from the inside of his shirt,” the report said. A deputy reviewed the video surveillance and confirmed that Mostowy entered the store and stole the box of wine and several packets of gravy mixes from the store in Vero Beach. “I was cooking at home and ran out of gravy, so figured I would run to Walmart and grab some. I just wanted to get out of Walmart quickly, so I figured I would just leave,” Mostowy told the deputy. Mostowy was arrested and transported to the Indian River County Jail where he was charged with trespassing and retail theft.